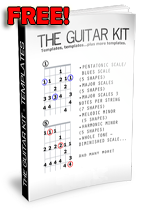 The Guitar Kit V2.0 – Updated and Improved! Thank you to all of you that downloaded and sent positive feedback about my Guitar Kit in the past year. I have uploaded a new and improved version. The main reason to upgrade is so that now it is all at 300dpi (print quality) and all the layouts are more consistent. Also, it is now a single PDF file (I am sure your computer will have Adobe Reader), much easier to navigate and print. Make sure you read the ‘legal’ and ‘printing tips’ in the Read Me file! Join our mailing list today to start enjoying exclusive content. Not only you will get The Guitar Kit free, but more exclusive lessons. I hate spam as much as you do and will never sell or give your information to anybody. I send a message out once a month (if so!). After you entered your details in the form below, you will receive a confirmation email and a separate email with the download link. When printing make sure you tick the ‘fit to page’ box in your printing options, so that all these templates will show correctly on any paper size. The ‘Scale Fingerings’ will print best in landscape format. If you find ‘THE GUITAR KIT’ useful (and I am sure you will) consider making a donation so I can keep adding free lessons and products for you all to enjoy! Use the DONATE button on the right of the screen at www.TrueGuitarist.com to make a donation safely through Paypal. I wanted to get a discourse heading about this area. Might you extend on just what anyone wrote about right here?